...just don't expect me to drink Lucifer's Lovejuice. 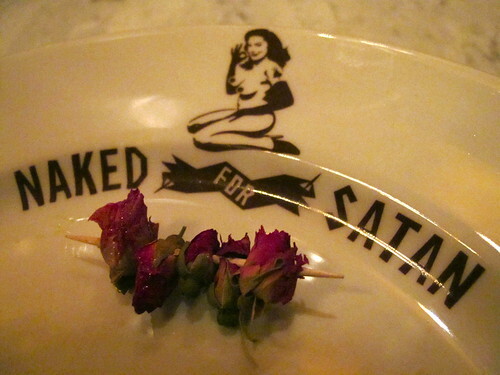 Naked for Satan is a gorgeous, shiny, Basque-style pintxos bar that opened a week ago on Brunswick Street. "We can't stop here! This is Basque Country!" 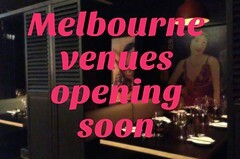 I went to check it out on Tuesday night with the lovely mlles Jess and Kate. We were wearing our highest high heels and our reddest red lipstick. Jess began, as is her wont, with a bloody mary (a 'Bloody Satan'), and I'm glad to report that it lived up to her bloody high bloody mary standards. Kate got a beer, then a Cava. I liked the sound of the cocktail with vodka, Campari and grapefruit juice, but I COULD NOT bring myself to order something called 'Lucifer's Lovejuice'. So I got a cider instead. They have Bulmers (with 'A Naked Twist') on tap. 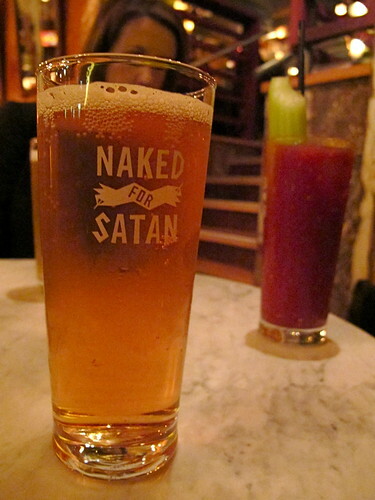 Also on tap is an ale called 'Naked for Satan Ale' - but as Jess so rightly pointed out, 'Ale Satan' would be a much, much better name! 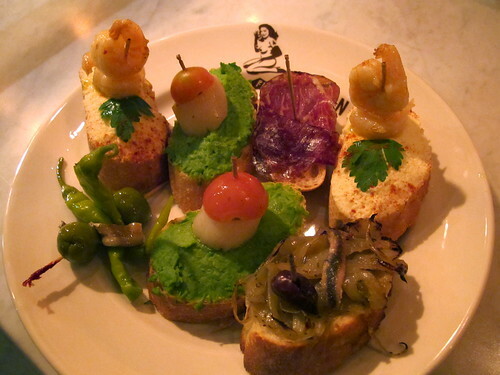 Pintxos (pronounced 'pinchos' and spelled with an 'x' in Basque) is the name for certin kinds of snacks commonly served in pintxos bars in Northern Spain. And pretty damn tasty pintxos they were too. 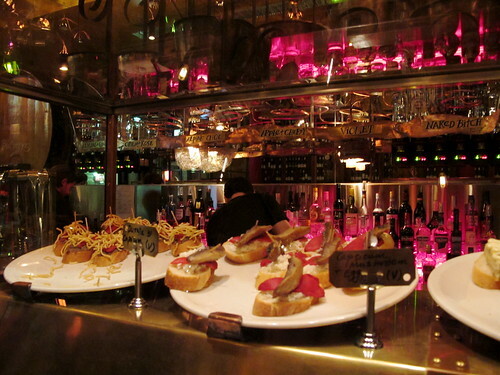 Highlights included the wagyu bresaola, the pissaladière, the blue cheese, lettuce and quince paste, the capocollo and the toothpick-skewer of olives, anchovy and guindillas pickled in white vinegar (like they do in Movida Aqui's bocadillos de calamares). The army of Naked for Satan staff would occasionally circulate the room offering trays of hot pintxos: the one we liked was the crumbed veal. It's bar food, and not as posh as the tapas you'd get at the Movidas, Bar Lourinhã or Añada, but at only two bucks per pintxo I'm certainly not complaining. But that's not all, there's more! 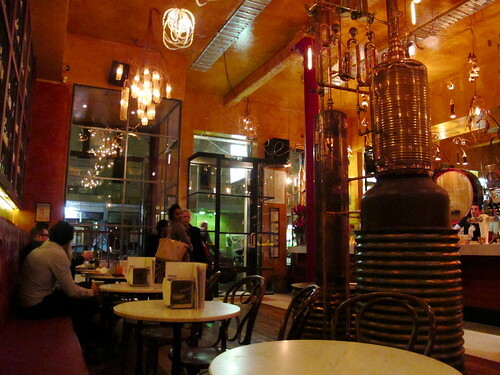 It's also a vodka bar, hence all the beautiful steampunk distillation getup in the centre of the room. I'd heard that they infuse their own vodkas on the premises so I tried their 'Opiumtini', a martini made with 'opium infused vodka'. 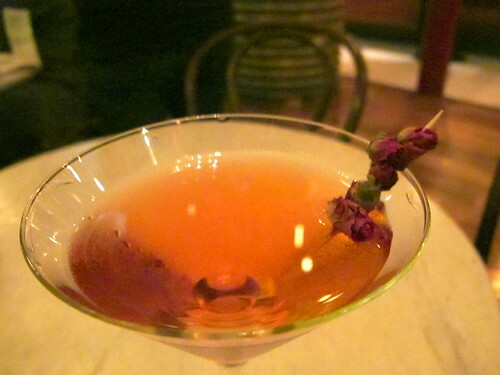 I asked the head bar honcho to elaborate and he explained that he adds a hint of rose to the poppies he uses to infuse the vodka. 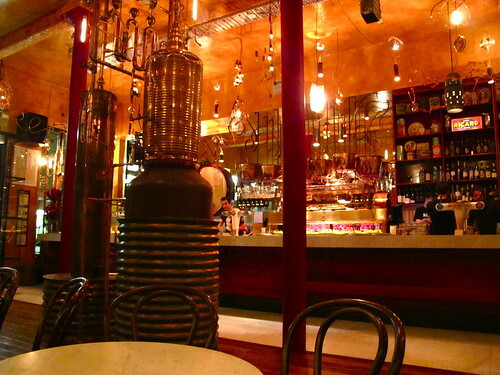 It turns out that vodka distillation is how the bar got its curious name, given the minimal clothing worn by one Leon Satanovich while making illicit hooch in 1920s Fitzroy (read the full story on the Naked for Satan website). looks awesome! although i had such a bad experience with vodka, i might have to stay away from all those cocktails if i ever go! 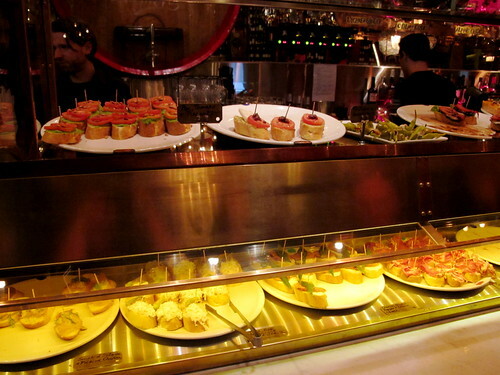 I've never been to a pintxos bar before and it looks like a great concept! Although toothpicks are easy to hide...I wonder how long this system will last? Wow, Cant wait to try this, finally someone a tapas/pinxtos bar serving food that actually resembles what you might find in a bar in Spain! When I first walked past the copper tanks in the window I thought what is this? art gallery or bar? 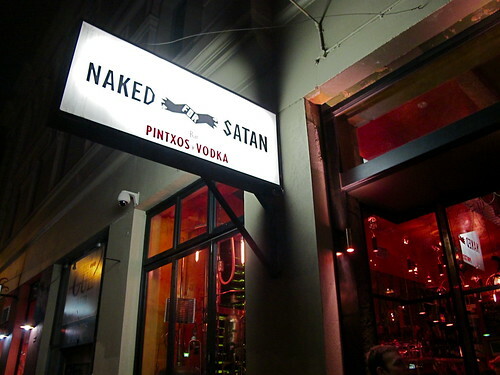 Can't wait to try Naked for Satan. I do hope their honesty system works. I can see myself spending quite a bit of time here when I live just around the corner! Also: "We can't stop here! This is Basque Country!" made me laugh quite a lot. Can't wait to try this out. Having just recently spent two months in Spain including a week in San Sebastian/Bilbao the honesty system seems to work fine over there where it is in practice. Would be disappointing if Australia wasn't honest enough for it to work here. Hi Steph - in an interview the owner said he knew that they'd get ripped off, but they hope it doesn't happen too much. I hope for their sake it works out! I know, Shu Shu, the interior is JUST GORGEOUS. 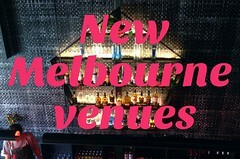 My new drinking venue of choice on Brunswick, I think. Let me know what you think of it, Penny! I've done the toothpick system in Spain as well. It's fun and makes for great bar food so I'll be keen to give this a go. What a cute looking place! And the concept is great, kinda reminds me of waiters in Germany, marking down the number of beers you ordered on your beer coaster at the pub! I was lucky enough to go for my bday on thursday. it was awesome! had a wide selection of treats, 2 glasses of wine and it all came in at about $30 each. I hate to say it but I have squirrelled away plates at a sushi train before!! But at $2 a pop, I'm sure I can keep my delinquent tendencies in check!! Did you read MC Claire's article in the Age? Haven't been there yet; can't wait to go! 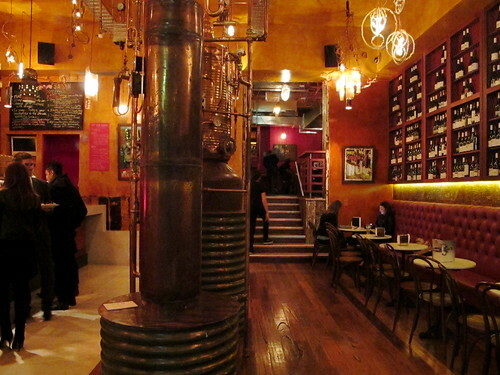 This place looks amazing!Definitely going to be checking this out soon, thanks for reviewing it. A friend took us to a basque style Pintxos place in Barcelona a while back and it was such a fun way to try loads of different tastes. I'm sure they factor in a few toothpicks being stolen, but I'm sure most people will be honest about it - it's only $2 per piece at the end of the day, you'd have to be pretty tight to bother stealing a few of those!